Across the landscape of alpine peaks, conifer forests, and mountain lakes that surrounds Pahalgam lie a number of sites of spiritual importance, and a great biodiversity of wildlife. Start off your visit on the 22nd (Fri): don't miss a visit to Chandanwari, appreciate the views at Aru Valley, and then tee off at Pahalgam Golf Course. Here are some ideas for day two: contemplate the waterfront views at Sheshnag Lake and then identify plant and animal life at Betaab Valley. Before you visit Pahalgam, use our trip planner to discover what you can do and see there. Dhaka City, Bangladesh to Pahalgam is an approximately 13.5-hour flight. You can also drive. In March in Pahalgam, expect temperatures between 15°C during the day and 7°C at night. 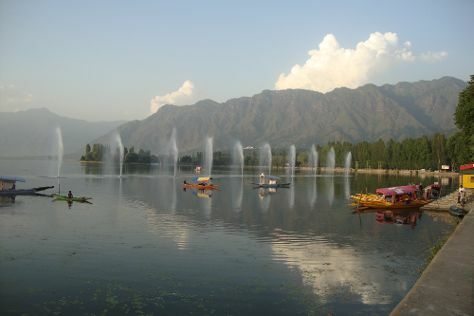 Finish your sightseeing early on the 23rd (Sat) so you can drive to Srinagar. Visiting Dal Lake and Nigeen Lake will get you outdoors. Next up on the itinerary: admire the natural beauty at Indira Gandhi Tulip Garden, contemplate in the serene atmosphere at Hazratbal, make a trip to Shankaracharya Hill, and explore the ancient world of Pari Mahal. For maps, traveler tips, where to stay, and more tourist information, go to the Srinagar trip app . Drive from Pahalgam to Srinagar in 1.5 hours. In March in Srinagar, expect temperatures between 15°C during the day and 7°C at night. Finish your sightseeing early on the 27th (Wed) to allow enough time to travel back home.